Facebook is launching a dating feature, pictures of which were leaked onto the internet earlier this week. Unlike Tinder and Match Group, it won't be a stand-alone app and will be a part of Facebook's main app. Facebook is making a gentle entrance into the world of online dating in an attempt to bring people together romantically. 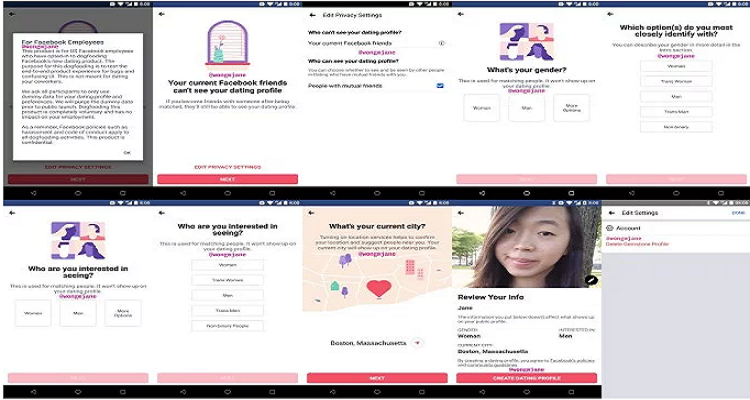 Thanks to screenshots uploaded to Twitter by mobile researcher Jane Manchun Wong, we got a sneaky insight into how Facebook Dating will look. She gave Facebook fans an early look at the onboarding process which gives off the impression of more purposeful dating unlike apps such as Tinder that is renowned for providing users with a one-night stand experience. It is currently being internally tested my employees and isn’t ready for the public just yet. “We are testing Facebook Dating internally (as we regularly do with new features), but we don’t have anything more to share right now,” Jillian Stefanki, a Facebook spokeswoman, said in an email. Facebook is yet to announce a release date for this dating feature. The idea is that once Facebook Dating has been activated, only those that have also activated the feature will be able to see your profile as it won't be shared onto your news feed. What's more, dating profiles also allow transgender male, transgender female, and non-binary options. It is no secret that Facebook has access to a huge range of information about your interests and other details it could use to find your perfect match. If two people do express interest in one another then they will be able to reach out to one another over messenger or WhatsApp. Finally, you will be able to change the settings to hide your profile from friends or friends of friends and you're Facebook Dating activity won't be shared to News Feed. Rumor has it that Facebook is also working on limiting the number of people you can reach out to which would prevent spamming. What's more, Facebook Dating will be 18+ only in the U.S.
CEO Mark Zuckerberg has been talking a lot about increasing “time well spent” on Facebook and introducing someone to their life partner could be exactly what Zuckerberg is referring to. This move from Facebook is one in an attempt to keep people connected and in turn stick with it as their favorite way to interact online. After recent security scandals, this could be exactly what the social media platform needs.